Meet my new baby, Georgina. I have no idea why I named her Georgina. It just popped into my head and I like it. My old sewing machine, had I named it, would have been Dinosaur, reached the point of no repair recently. I never figured out how to use the 25 or so stitches it supposedly could do and he (yes, it was a “he”) was down to only a straight stitch when his parts became un-replaceable. If you know about sewing machines, they generally last for decades before you can’t get parts for them anymore. Dinosaur was used when I got him, so I’m estimating his age to be around 30ish. In the past I have been a sporadic seamstress. 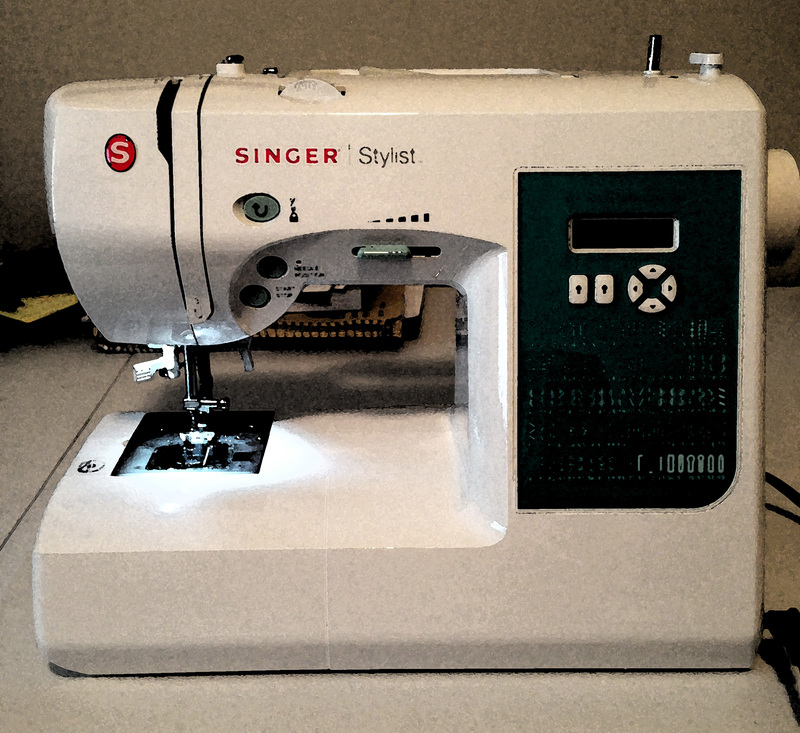 As a child I got extensive training on a sewing machine from my Mom, a sewing class she signed me up for and in Home Economics (yes, I am that old). Thanks to a very complicated dress that I made in Home Ec. I burned out on clothing at an early age and limited my sewing to home décor. Straight lines as much as possible. Recently there must have been a planetary shift. Just as my Dinosaur was reaching the end of his life, I began to want to sew again. Clothes, for heavens sake! Then, another strange occurrence happened. A friend rescued piles and piles of upholstery fabric samples from her neighbor’s trash heap. Perfectly good fabric! Going to the dump! She offered it to all her crafty sewing friends. By the time I reached the pile several folks had picked over it and there were only four, WAIST HIGH, piles left. I got a few armloads into my car and headed home. Before I got half way there, I heard that voice. You know, the one that you know you are going to listen to, but will live to regret listening to? “Take it all” it said. “Four WAIST HIGH piles of upholstery fabric?” I asked. “You know I live in a two bedroom townhouse, right?” I told it. “Ah, but you have a storage unit you just cleared your daughter’s stuff out of.” it reminded me. Well, darn, who can argue with that! So, I drag my boyfriend and his Ford 350 truck to my friends house and loaded up the fabric and refilled my storage unit. Now I have to make stuff. Lots of stuff! As for my suddenly wanting to make clothes, I have a secret. I primarily work from home (I really need to write a post explaining my work life), but regularly need to go see my clients. After six years of working from home I have discovered that my brain functions better when I am in my pajamas. This should be scientifically studied. I have talked to other work-at-home folks and listened to many podcasts & interviews with work-at-home folks. I am not alone in this. Thousands, maybe millions of us are cranking out some major productivity in our PJs every single day! Now, my secret is…that I want my professional clothes to be as comfortable as my pajamas, but still be socially acceptable in a business office. “Impossible!” you say? Ah, I have to argue that point. Now, granted, the typical banker’s business suit will never work, but I am a creative person in a creative business. People cut you some serious slack for that. We can get away with outfits that most people can’t. After many hours of Pinterest research (you have no idea how good I am at that) I think I have put together a versatile wardrobe of super comfy clothes that can go from my living room sofa to an attorney’s office without a single cocked eyebrow. Unfortunately, these clothes only come as sewing patterns in my budget. And that, my friends, is where Georgina will work her magic! Oh, and a few million yards of upholstery fabric that she has to deal with. I promise to post pictures of the process and the finished products. In my happy place, all this goes very smoothly…..